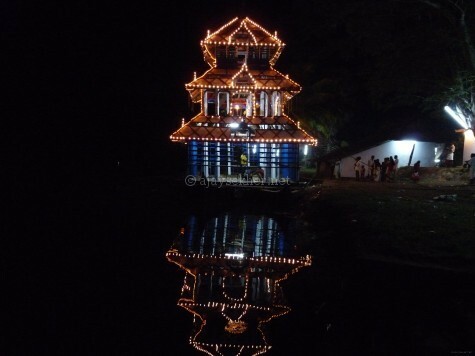 Garudan Paravai at Pallypuratu Kavu, Kottayam, 24 Apl 2016. When summer becomes unbearable during the month of Meenam or Metam that comes during April-May season, the ancient Kavus or sacred-grove shrines of mid and south Kerala; now turned into Brahmanical Hindu temples all around the lake Vembanad perform the Paravai and Tookkam, now widely called the Garudan Paravai and Garudan Tookkam. It is traditionally performed in the Kavus of Kottayam, Ernakulam and Alapuzha districts. It is a ritualistic performance in the form of a bird masquerade in which performers are embellishised in the makeup and costumes that resemble a bird with beaks and small stylised wings and dance and perform to the powerful rhythms of the Chenda or the traditional Kerala drum. They also entertain the spectators by picking up the currency and coins from the ground. 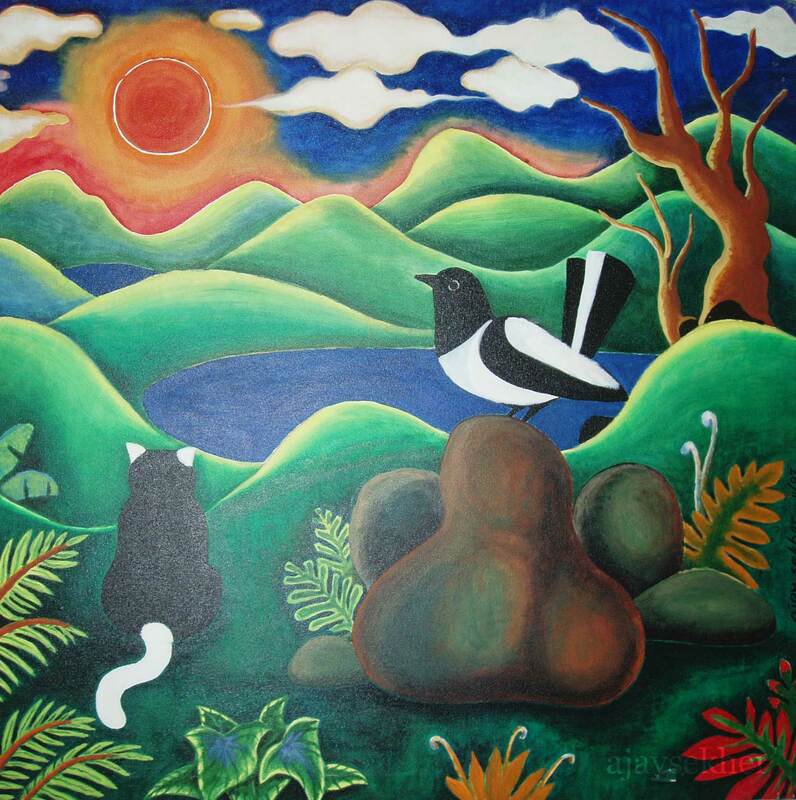 Their fast gyrating movement is equal to the flight of the birds. 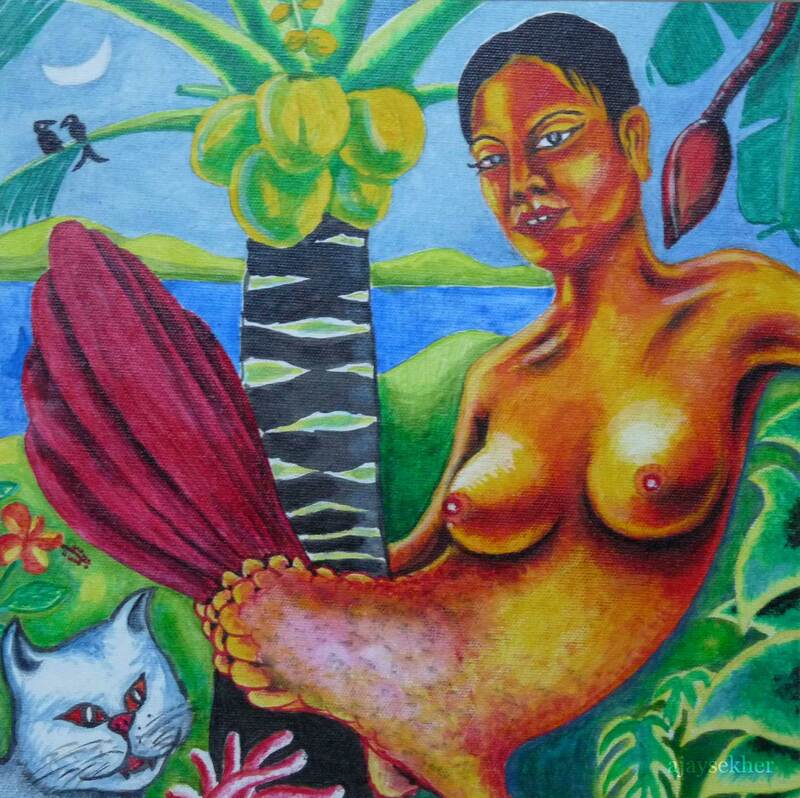 This vibrant and powerful performance is on the decline now. In the past in an associated ritual the performers were ritually mutilated with a metal claw at the lower end of their backbone and hanged partially on that claw from a high pole set on a cart that is pulled into the shrine in a procession and also pulled around the sanctum sanctorum thrice. It is also performed during the month of Kumbham and Makaram in some shrines during the days of Bharani or Pataamudayam. Earlier in Kavus like Manarkadu Kavu, Perur Kavu, Pallypuratu Kavu etc. near Kottayam bullock carts and hand drawn carts called Chadu were used to pull the performers on the pole to the shrines. Now pic up vans or mini lorries are used as the cart. At Vadayar Ilamkavu south of Vaikam the performers are hanged in a huge country boat around a ritualistic spectacle called Kettukazhcha a pagoda like wooden architectural structure. 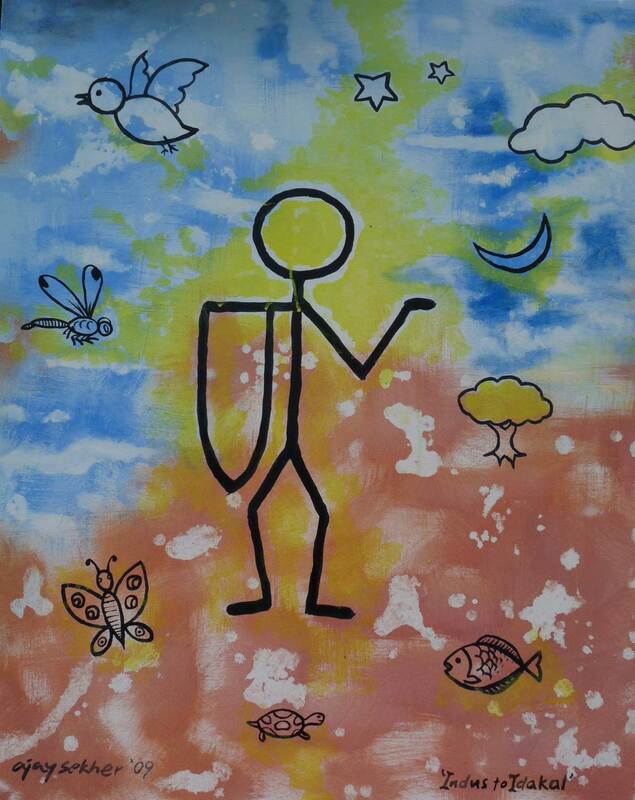 The whole performance is also called Aatuvela or the performance in the river. 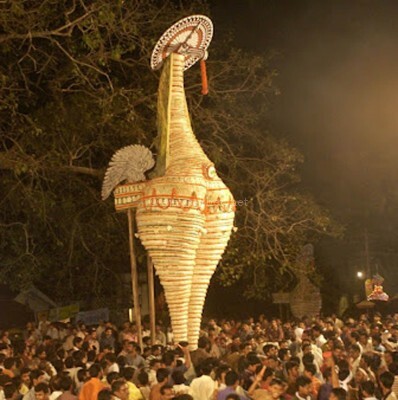 This provides parallels with the Kaala Vela and Pooram spectacles of north that constructs the bull effigies and the horse effigies of the southern Kettukazhacha rituals. The Paravai image also closely resembles the Annam (swan) Kettu in Neelamperur Pally shrine which was a Buddhist Pally or Vihara till a few centuries ago. It is also worth observing that in the Kaala Vela or bull spectacles in Malapuram the cherub figures that we see in Ajanta and Ellora are also seen even today on both sides of the main deity. Paravai and Tookkam ritual performance is distributed all along the rim of lake Vembanad and is culturally located in the former mid Kuttanad region, the land of Kuttan or Putan a rustic term for the Buddha. It is also performed in association with the full moon nights connected to Chitra Paurnami and Vaisakha Paurnami having key calendar connections with the birth and life events of the enlightened one. 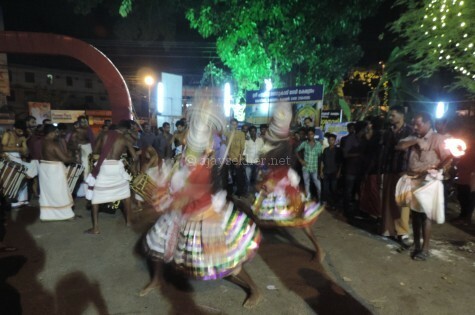 In Kottayam Manarkadu and Pallypuratu Kavus hosted hundreds of performers in the past. It is normally staged after midnight. During the day of Pataamudayam, the tenth sunrise after Vishnu Sankramanam, daytime performance processions called Kumbodam or Kumbha Kutam and Kavadi were also popular. As the name shows Kavadi is a miniature representation of the Kavu itself with an arched horse shoe like Ajanta Chaitya Vatayana motif. Kumbham and Kutam are both miniature motifs and key icons resembling the Stupa’s global or spherical structure. Both these processions are of Buddhist origin when we analyse the semiotics and cultural significations. But after the middle ages ritual mutilations also crept into this Kumbodam tradition in the form of Sulam Kutu or body piercing using metallic little lancers as a result of Hinduization and its violent sado-masochist Himsa cults in the frenzy of Bhakti. Now the ritual is dwindling. In earlier days it was mostly the Avarna who were the performers in Paravai, Tookkam and Kumbodam. 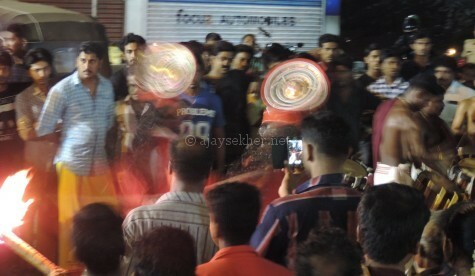 Velan, Viswakarma and Ezhava performers were there in Kottayam. 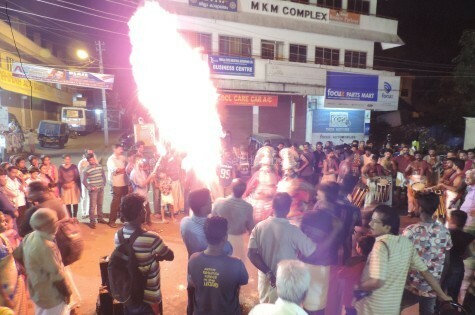 Since the Tookkam was barbaric and was misused by the caste Hindu hegemonic forces as a ritual re-enacting the symbolic submission and ritualistic mutilation of the Avarna before the Hinduized deity, especially Kali in violent and bloody form; it was banned in places like Ilavoor in the north of Ernakulam. Most of these Kali temples are altered Mahamaya sacred grove shrines or Kavus of Buddhism, violently taken over and modified into Hindu Kali temples. It began with the Kavu capture or Kavu Teendal at Kodungallur and spread into the various interiors of Kerala after the 9th century conquest of the Kodungallur Kavu by the Hindutva hooligans or Sudra and Chandala Komarams who were given temporary license to do the damage to the ethical Buddhist civilization by Brahmanism and its oligarchies, the priestly-militia nexus in power. 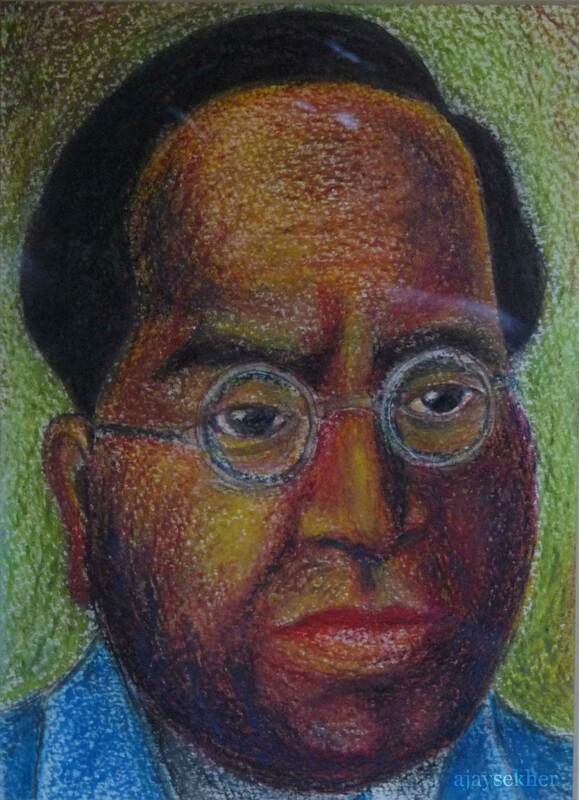 Sahodaran Ayyappan the pioneering social revolutionary of renaissance and poet has composed the song “O Dont go to the Bharani… O Brothers…” in early 20th century to check the Hinduization of the Avarna Bahujans in Kerala and to remind them of this cultural internal imperialism or Hindu colonialism of Brahmanism. The ancient Kavus were originally sacred groves or Sangha Aramas in the Buddhist period at least from BC third century when Asokan missionaries, the nuns and monks came and spread the letters and ethics among the people of Tamilakam to the middle ages when Hindu Brahmanism and its hooligan henchmen captured and converted these Kavus into Kali worshiping bloody ritualistic dens. The Aswati Kavu Teendal or ritual encroachment of the Kavu at Kodungallur still re-enacts this violent and bloody takeover in which nuns where raped and turned into Devdasis and monks where executed in unimaginable barbarism. They also demolished and removed the idols of the Buddha and his mother Mahamaya and her sacred-grove shrines were violently converted into Kali worshiping temples of ritual sacrifices and violent bloody cults. This was how Hindu Brahmanism was established through bloody pogroms and genocides of the Buddhists and Jains in Kerala by its subservient and moronic henchmen who were co-opted as the last and fourth Varna the Sudara in Kerala. Because of the brute hegemonic power of violent Hinduization some of the Chandala or Avarna Komarams or oracles are also following the Hindu style Kali worship and bloody ritual cults. After this bloody takeover the priestly-militia nexus in power created the story of Kali killing the demonised other or the Buddhist in the figure of Darika the Asura. Demonisation precedes pogroms. 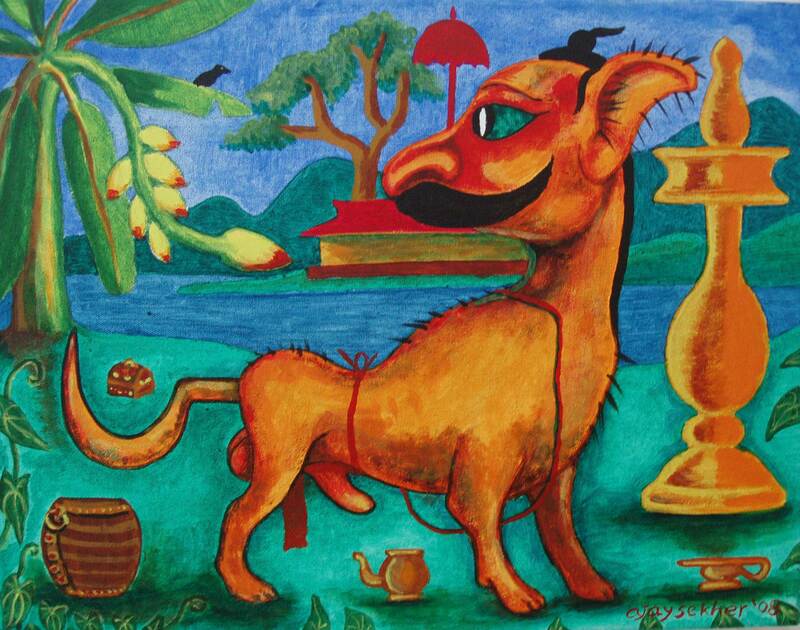 Sri Lanka was demonised in Hindu epics like the Ramayana as it was a Buddhist country. According to the Hindu legend, Kali’s blood thirst was not satisfied by this covetous killing and then the greater lord Vishnu sent his vehicle the Garuda a huge eagle and it presented its blood so that Kali was quenched. This ridiculous and absurd story of a blood sucking Kali Mata is a cunning articulation of the demonization and then extermination of the south Indian Buddhists by the henchmen of Brahmanism and then the ritualistic re-enactment of the holocaust and the bloody pogrom in the yearly festivities at the shrine as a re-establishment of the caste Hindu order and hegemony over the Avarna or the former Buddhists. 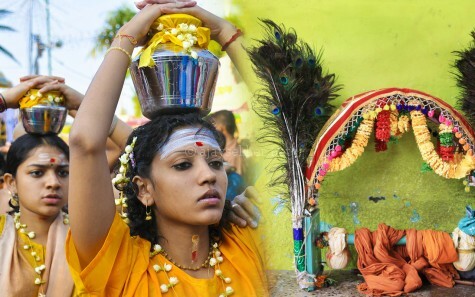 The makeup, costume and performance legacies of Parava also place it along the Annam Kettu or bird effigy spectacle, part of the ritual spectacles in Kerala like Kala Kettu and Kutira Kettu in various ancients Kavus. Kettukazhcha tradition is clearly Buddhist and it articulates the agricultural and rural gusto and carnival co-operative community will of the village society. This is not ritualistically or aesthetically or visually akin to the kind of violent performances related to Kali cult as in Teeyaattu or violent and bloody cults and rituals in Padayani, both performed by the caste Hindu militia clans in high contrast. Only the Annam Kettu (bird effigy) ritual and form of Neelamperur Pally shrine that was consecrated after Mahamaya and the Buddha by Pallyvanar the last Buddhist Chera prince from Kodungallur is resembling the figure of the Parava. It is clearly not an eagle but a stork or swan like figure. 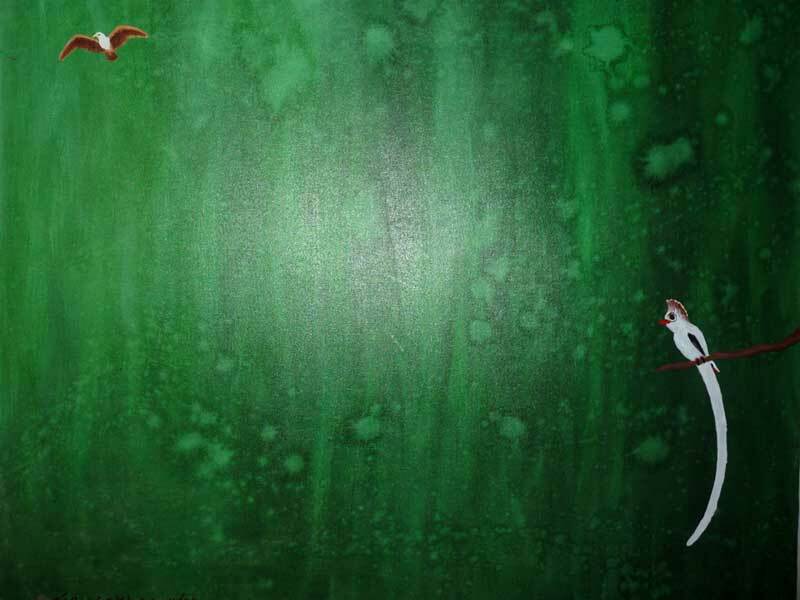 The close association of the Parava figure to the Swan figure in Nalacharitam Kathakali is remarkable and significant. 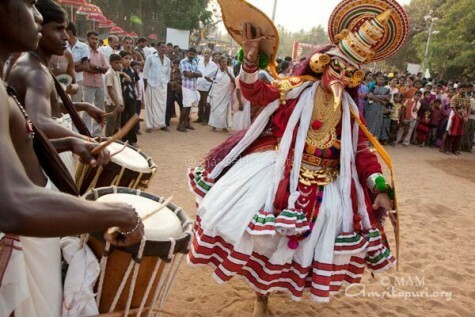 In costumes or Udutukettu also the Parava closely resembles the Kathakali style of swollen and fleeted white cotton attire. It is clear that it is not related to the Teeyaattu or Padayani wild forms but related to a much subtle and nuanced Mudra based stylistics and semiotic system like Kathakali that has its origin in the Attam tradition originally belonging to the Buddhist visual performance culture that was later Hinduised post the middle ages. More of a swan than an eagle and closely resembles the Hamsa or swan of Kathakali having Buddhist lineages. Photo from internet. Its field and habitus well within the Vembanad lake rim and its aesthetic and performance style and legacies clearly connect it to the land of Kuttan or Putan, the Kavu or sacred-grove shrine conservationist culture related to the nuns and Mahamaya; and to the greater ethical and egalitarian culture of Buddhism in Kerala. 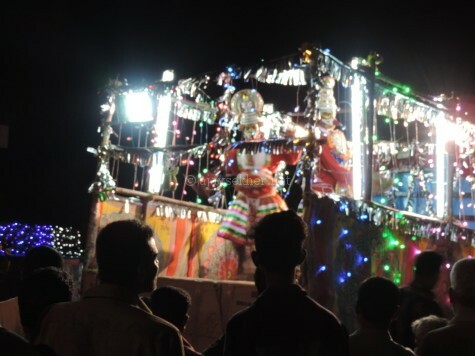 It also fits well into the carnival spectacle or Kettukazhcha tradition of Buddhism as closely re-enacted even today in Vadayar Aatuvela; and also proclaims its key affiliations with the highly stylised semiotic discourse of Kathakali that has its roots in the symbolic or Mudra based aesthetic and semiotic cultural discourses of Buddhism in Kerala. This entry was posted in Cultural Politics and tagged bird masks in Kerala, conversion of Kavu into temple, Garudan Parava, Garudan Parava and Tookkam, Garudan Thookkam, Hinduisation of sacred shrines, Kali cult in Kerala, Kathakali and its genealogies, Kavu and Buddhism, Kavu culture in Kerala, Kavu into Kali temple, Kavu Teendal, Kuttanad and Buddhism, Manarkadu Kavu, Pallypuratu Kavu, Paravai, Paravai and Attam, Patamudayam, Perur Kavu, sacred groves in Kerala, sacred shries into temples, the evolution of Kathakali, Vembanad and Buddhism on April 24, 2016 by Ajay.